The state of New York has pledged to invest millions of dollars towards the construction of a giant solar factory. The GigaFactory, which will be located in the city of Buffalo, will manufacture solar panels and is expected to create more than 3,000 jobs. 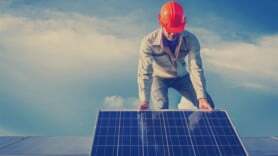 Governor Andrew M. Cuomo announced the state would invest $750 million (£460m), mostly to build the facility and add infrastructure while developer SolarCity will cover the remaining costs. It is said to be the largest facility of its kind in the Western Hemisphere, with more than 1GW of annual solar capacity when it reaches full production. The facility is expected to be online in 2016. Car manufacturer Tesla is also constructing a GigaFactory for electric vehicles battery.